Over the years, Newcastle Corporation had quite a number of Daimlers, both double and single deck, with a variety of bodies from different coachbuilders, but with the demise of the half cab in favour of front entrance rear engine buses they stayed very firmly entrenched in the Leyland camp. However, that’s not to say that they didn’t dip a toe in the water. This Daimler demonstrator pictured at Tynemouth is on loan to Newcastle Corporation. The service 11 ran from Newcastle Haymarket to Tynemouth, and was shared by NCT and NGT’s Percy Main depot. When it first started in 1928, the operating licences were divided equally between Newcastle Corporation, Tynemouth and District Transport, and Wakefields Motors Ltd. Wakefields subsequently became part of the NGT group, but all their operators licences remained in their name, so officially, three Percy Main vehicles on this route either had to carry the Wakefields name, or display an ‘On hire to Wakefields’ sticker, needless to say, this was a formality that was frequently overlooked. 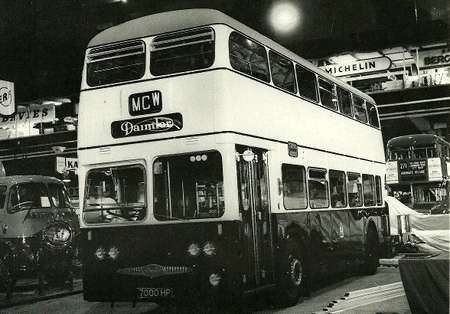 Two Demonstrators were shown at the 1960 Commercial Motor Show, one was a chassis, the other a CRD6 model, with chassis No.60000, the well known 7000HP, in Birmingham City Transport livery, shown above. Blue Bus Services (Tailby and George) also took 5 more Fleetlines one of which was the first production chassis – 60003, bodies by Northern Counties in 1962, 324 YNU. 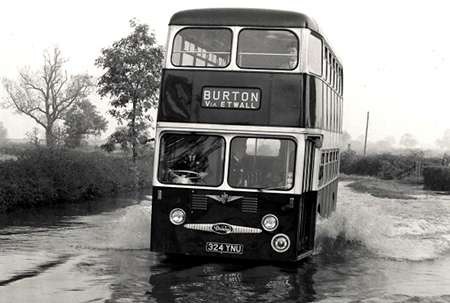 Seen here in the 3rd picture negotiating flood waters (just shows they are not a modern problem as the press would have us think), on the Derby to Burton via Etwall service, later to be numbered 46 by Derby Borough Transport on the takeover by that concern in 1974. Thanks for posting this, Ronnie. I found it rather intriguing! The vehicle shown is, indeed 565 CRW, and I have a bought colour shot of her in a livery with slightly more cream. What intrigues me is that I have vague memories of a Daimler/Alexander demonstrator with an awkwardly similar registration, namely 595 CRW. Were there really two of them, or is my memory card in need of replacement??? Here’s another demonstrator on the 11 Tynemouth to Newcastle, arriving at the Haymarket. Photo by Bob Mack. Atlantean SGD 669 started life as Glasgow Corporation LA91 then returned to Leyland for use as a demonstrator, afterwards moving on to the Fishwick fleet in Leyland as their no. 34. IIRC it was in Newcastle during 1964, AFTER the Corporation had committed to this style of bodywork in 1963 on the first trolleybus replacement Atlanteans (1-12 JVK) so I’m not sure what it was demonstrating at the time! Or was it working with Tynemouth, Ronnie? Does anyone know why this vehicle was chosen for its wider role? Did it initially have any features different from the Glasgow standard? I think (fatal!) that its green panels were changed to matching yellow for its time in Newcastle, so perhaps other modifications happened as well. Did it run in Glasgow colours while in Halifax? 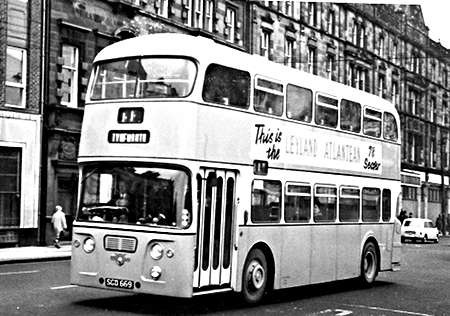 Glasgow had loaned different Atlanteans to Leyland for demonstration work. Theirs were 30′-8" long and with this stylish Alexander body would have conveyed the modern image of a bus that Leyland would wish to portray. 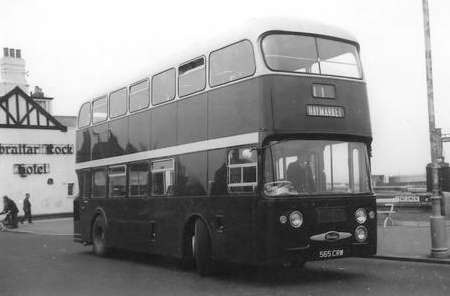 Glasgow and Leyland came to an agreement to part with LA91, replaced later with LA202, presumably to make a vehicle immediately available to Leyland. A six-month wait would risk letting Daimler seize the opportunity. 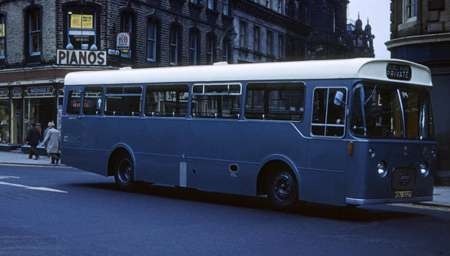 As a demonstrator its Glasgow livery was certainly changed to one more like the Newcastle one, without the green. I am pretty sure there was no 595 CRW, or at least a Fleetline with that number, but 565 CRW certainly demonstrated in two liveries as it appeared at Halifax in both guises. Can’t say for certain, Tony. I started at Percy Main in January 1967, so this was before my time, however, by 1963, T&D had 22 PDR1/1’s, which was roughly a quarter of the D/D fleet. 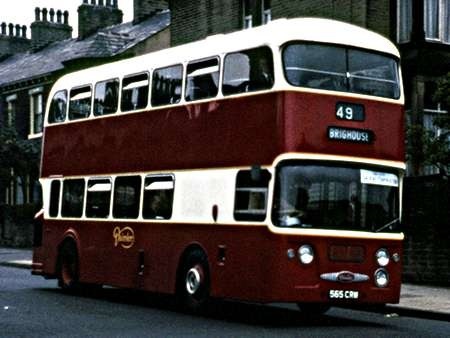 In 1963, they took delivery of the first of two batches of Weymann bodied CRG6LX Fleetlines, followed by three batches of Alexander bodied versions in 65/7&8. I lived close to Percy Main depot, and took a keen interest in what went on. From memory, demonstrators were usually to be found working the very busy stop start Whitley Bay to Lobley Hill Gateshead service 1, which was a greater test of stamina than the equally busy but less demanding service 11. If you want my opinion, I would say that it was with NCT rather than Tynemouth. Pete, there were no other Fleetline demonstrators around at the time of 565 CRW. I think it replaced 4559VC, a Northern Counties-bodied example which went on to spend many years with Procter’s of Hanley. Tony, although SGD 669 is nowadays widely-referred to as being ‘ex-Glasgow’, I have to cast doubt on the notion that it actually reached there. Leyland had already, on separate occasions, borrowed two Glasgow Atlanteans, I think they were LA6 and LA83. It was then announced that Glasgow had agree to ‘sell’ LA91 – but it is my recollection that at that time deliveries had not reached that point, and, if that was the case, LA91 would still be in build. Also, it does seem unlikely that Leyland would buy back an already-delivered vehicle when identical ones were still being completed at the rate of, probably, two a week. SGD 669 took up its demonstration duties in mock Newcastle Corporation livery – there again, why repaint a bus after a week or two in service, when one could be painted to order from scratch? You’ll see that I said Glasgow had agreed to ‘sell’ LA91 – but it was ultimately replaced by LA152, which was effectively added to the next order for fifty similar buses. So the situation would appear to have been a bit more involved than a simple ‘sale’. To the question of whether it ran in Halifax in Glasgow colours, I’m obviously doubting that it ever received those colours, and I’m pretty certain that it didn’t do any demonstrating in them. When the Atlantean was demonstrated in Aberdeen it was painted yellow and cream Newcastle style. 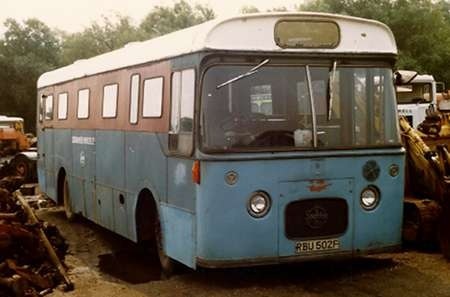 From memory it had also been in France, the wording on the offside was "Ici Le Leyland Atlantean 78 places". 565 CRW saw service with both Grahams of Paisley and Moffat and Williamson of Gauldry. 565 CRW demonstrated at Halifax three times. The first time, in April 1964, it was in a different livery to that depicted above, using a deep brownish maroon and a rich cream. It returned to Halifax in October 1964 to demonstrate to Hebble in the same livery. It returned to the Corporation again in September 1965, by which time it had been repainted in the Edinburgh style with a lighter, more Edinburgh-like red, but with more of an ivory relief colour, rather than Edinburgh’s white. 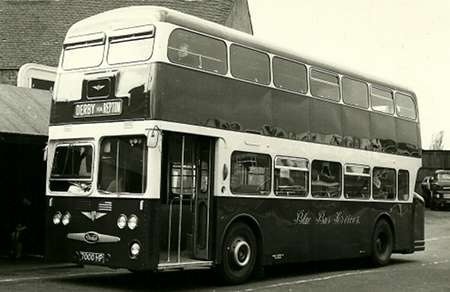 It paid a longer third visit in August/September 1966, just prior to the Corporation’s own first Fleetlines being delivered, still in the same livery. I think much of its extended stay involved some engineering familiarisation. Something has just struck me regarding the Alexander body. On such a modern design for the period, why did they continue with rear mudguards when others had abandoned them? It looks particularly odd given the lack of matching ones for the front wheels. If memory serves, Phil, the rear wings were rubber, and so less prone to accidental damage when removing the wheels, especially the inners. Here is Daimler Fleetline 565 CRW in King Cross Road, Halifax en route from Hebden Bridge to Brighouse when on hire to HPTD in the summer of 1965. The picture was taken late in the evening when I spotted the bus and just managed to get off a shot (with entirely guessed exposure settings) as I walked home, hence the indifferent quality of the picture. The hopper windows were uncommon in those days, I can’t recall any local Operators using them (ECW fitted them to Lodekkas etc). Was this body tagged on to one for regular Alexander users (Glasgow or SBG?) Maybe they specified them? They look much neater tan sliders. 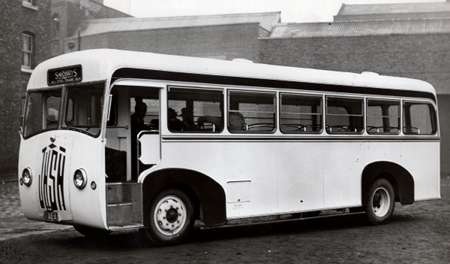 565 CRW had an A-type body with body number A/1363. Alexander’s body numbering was a bit erratic at the time as they kept changing the system, but the only other A-types ordered around the same time seem to have been A/1663 for AA, Ayr (XSD 430); A/1963 for McGill, Barrhead (AHS 16B); A/2063 for Graham, Paisley (HXS 864). Looking at photos of these three on the web show that all had normal sliding windows. I am sure 565 CRW worked for Harper Bros (Heath Hayes) as a demonstrator for a while in the mid sixties, but if my memory is correct there was a lot more cream livery on it then. Significant information just published in Buses Mag December 2015 page 84 reveals that 565 CRW was shown at 1963 Scottish Motor Show in Glasgow Corporation colours, finished to Glasgow spec. Having a life-long interest in Fleetlines I was not aware of this but Alan Millar confirms this was the case. Buses Illustrated January 1964 issue page 7 states "By the time this column went to press no order had been placed by G.C.T. for another Fleetline" (GCT already had SGD 730, new in May 1963) "But the Show model was finished in G.C.T. colours and to G.C.T. specification" Has anyone seen a picture of 565 CRW in Glasgow colours? I always liked that Alexander body style on Atlanteans and Fleetlines. 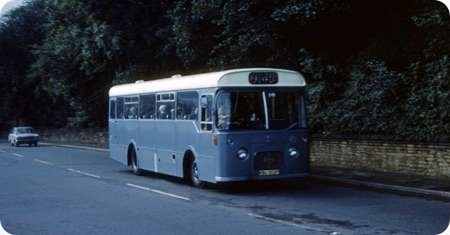 Bury had 15 on Fleetline chassis, 117-131, later Selnec 6317-31. They were the only ones in the combined fleet after the PTE took over with the highbridge version of the body, although North Western had quite a few with the low height version. Bury had one of those for a short time, YJA 2, in overall advertising livery for Quicks for Ford.